Feel like you're surrounded by piles and clutter in your classroom? Not sure where to even begin? Well then, you're in luck! I love organizing (so much so I even won the "Most Organized Award" at school this year) and I can't wait to share some tips with you. Whether you need a total class makeover or just a refresh, I've got you covered. I like to use hanging folders for a variety or purposes all around my classroom. I store construction paper in a crate (rainbow order of course) so it doesn't get all wrinkled and fall off the shelf. I have one thin file box for student files where I keep their reading and math assessments, absence notes, and other important papers and records for each child. I also have a box with take home books. I print leveled books from the Reading A-Z website (which I am in love with!). I color code the spines by level and have a hanging folder for each. Students can switch out books at their own level each day to take home and practice reading. So each classroom I move in to seems to come with an old scratched up filing cabinet, that of course can't be moved. Over the years I have tried to reduce the number of worksheets used and go digital with many things (and also make it look cuter thanks to a roll of dry erase paper and duct tape). This meant I had empty space in my monstrosity of a filing cabinet. Clearly I am a teacher hoarder so empty space didn't last long!! I now use my filing cabinet to store my teacher read aloud books and mentor texts. Plus, any books about character education, diversity, etc. that I want to have easy access too (and not dig through my library for) go in the drawer. Along with the files for each math standard I also put my read aloud inside the folder. For example, I have one file for Addition and each of my books that I use for literacy connections when introducing addition can be found there. Sometimes I keep extra supplies in my filing cabinet but I try to be careful about not putting too much stuff inside so it doesn't turn into a giant junk drawer. As teachers we end up with large amounts of themed and seasonal materials, or at least I know I do! While I have boxes for materials (like math and literacy centers) that can be used year round broken down by standard, some materials I only need once or twice a year. I have a HUGE box for Christmas/Winter materials and one for my End of Year themed days. I also use banker boxes for all of my other seasonal materials. Inside of each box I include decorations, special centers, themed books, and any worksheets or activities I may need. I just switch out the box on top of my stack each month and move the one I don't need anymore to the bottom. Plus, anything new that I accumulate during a holiday season just gets tossed into the correct box so I can find it again without stressing the next year. I am obsessed with labeling everything! I use Avery 2x4 inch labels to organize materials, classroom manipulatives, library books, and everything else I can get my hands on. I use the Avery design studio, which is actually very easy to do, to choose a cute background image, font, and clipart image. Having labels makes it easier for me to find what I need, but also for my students to know where to put things back. Well, I hope you are inspired to clean, clean, clean and organize your classrooms! I find that the end of the year is the perfect time for me to get rid of old junk, and go in to the summer feeling fresh and prepared. Of course, these tips will help you out any time of the year! Good luck teacher friends! 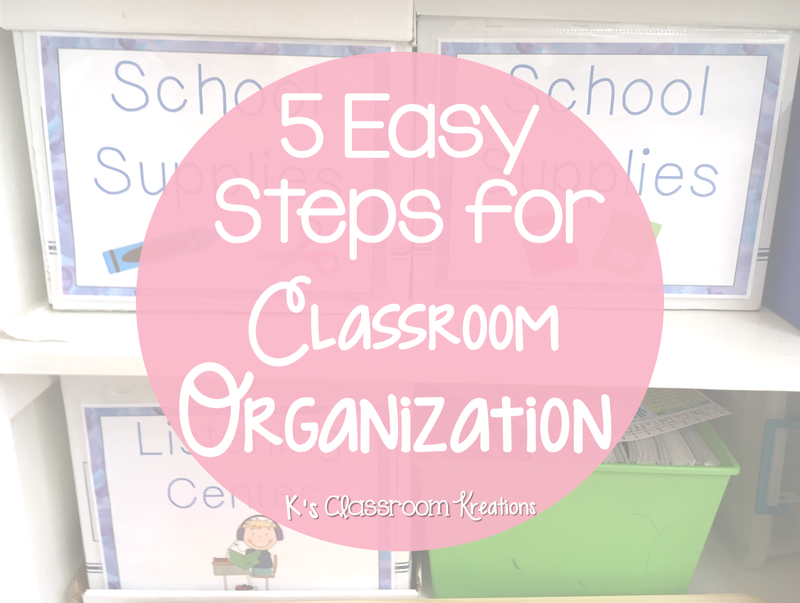 Informative tips for organising your classroom, my team share this post with other teachers and students at QandA website.